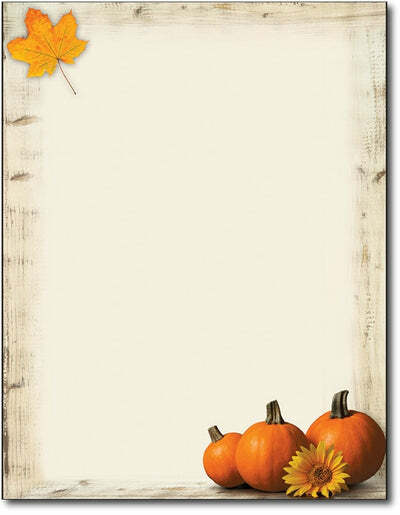 Pumpkin Sunflower Fall Letterhead captures the beauty of Fall as the background for your letter! This Autumn design featurees 3 pumpkins and a sunflower over a wood border. Use this Fall stationery to send your Halloween or Thanksgiving invitations & letters! This Fall Letterhead is made from a 50lb Text paper stock that is inkjet & laser printer compatible. Each Fall themed stationery sheet measures the standard Letter size of 8 1/2" x 11".